H2 receptor antagonists are among the most widely prescribed gastrointestinal drug classes; medicines used to treat symptoms and conditions caused by excessive gastric acid production. H2 antagonists used to be first-line agents in the treatment of gastric acid conditions, until they were superseded by the more effective proton-pump inhibitors. The first H2-antagonist – cimetidine – was developed in the 1960s by Sir James Black. 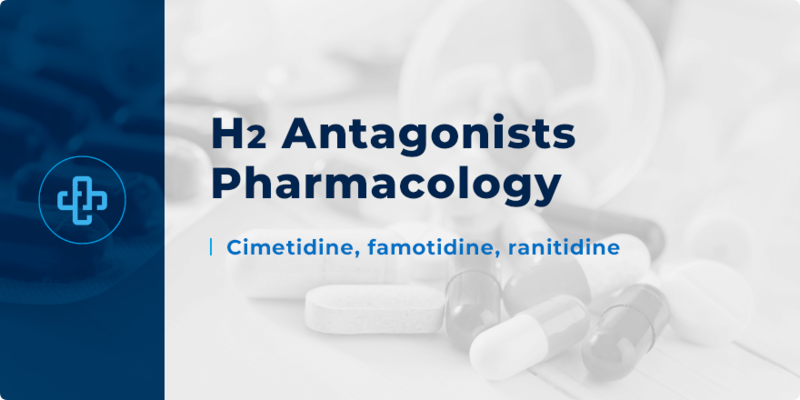 Of all H2 antagonists, cimetidine is associated with the most side effects and most drug interactions. Later antagonists – such as ranitidine and famotidine – are well-tolerated and have few, if any, serious drug interactions. Peptic ulcer disease – they are used to treat and prevent ulcers; causative factors include NSAID use and duodenal ulcers. Again, proton-pump inhibitors are considered first-line agents. Nonetheless, H2 antagonists remain an important clinical alternative. How do H2 receptor antagonists work though? In what way does their mechanism differ from proton-pump inhibitors? H2 antagonists work by preventing histamine release from enterochromaffin-like cells (ECL) – with histamine acting on nearby parietal cells. Histamine is one of many independent elements responsible for “activating” the proton pump within parietal cells. By inhibiting histamine, gastric acid production is reduced. That’s what differs the mechanism of H2 antagonists from proton-pump inhibitors. H2 antagonists limit acid production, whereas proton-pump inhibitors suppress acid production much more effectively. In other words, PPIs inhibit the terminal stage in stomach acid production whereas H2 antagonists do not. This is what makes PPIs much more effective at reducing gastric acid production. H2 antagonists are well-tolerated agents. However, they are associated with their own range of potential side effects. Many of the side effects listed below are common to cimetidine but considerably rarer in later antagonists. A small minority of patients taking cimetidine have experienced gynecomastia. An even smaller minority have experienced loss of libido, a reversible effect upon discontinuation of cimetidine. That cimetidine is associated with considerably more side effects and drug interactions compared to later H2 antagonists, such as ranitidine. That H2 antagonists have a faster onset of action compared to proton-pump inhibitors. This may become useful if relatively immediate acid suppression is sought – for example, prior to surgery to prevent acid aspiration into the respiratory tract. That H2 antagonists can mask the symptoms of gastric cancer. Patients should be monitored for serious symptoms such as difficulty swallowing and weight loss. Due to the pharmacokinetics of cimetidine, it increases the risk of toxicity when taken with medicines such as warfarin, phenytoin, quinidine, TCAs and propranolol. By increasing gastric pH, H2 antagonists can increase the risk of developing Clostridium difficile colitis. H2 receptor antagonists are classified as pregnancy category B – meaning that “there is no risk in non-human studies”. Though H2 antagonists have largely been superseded by proton-pump inhibitors, they remain an important acid-suppressing alternative and remain, as such, a valuable drug class in the physician’s toolkit. Want to learn more about H2 antagonists pharmacology? Register with PharmaFactz today to receive instant access to all the resources you need. In the meantime, take a few moments to join our newsletter (above) to receive all the latest facts direct to your email!